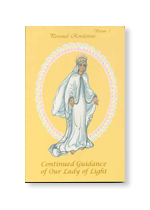 Personal Revelations of Our Lady of Light, Volume 5. This volume presents important messages back to the beginning in 1992, then fast forwards to Our Lady’s final public visit in 2004. It includes text which had not been made public earlier at the request of Our Lady. Her words include warnings about future events which the faithful can ameliorate through prayer. Many of Our Lady’s priests and dedicated faithful are depicted at the various apparition sites. 127 pages.